The three worst places to be if circumnavigating Isle of Wight would be in vicinity of Bridge Bouy in a f5-6 or worse and if tide turned not nice,St Catherine's race with wind over tide,and I am told entrance to Chichester harbour on the ebb,not really the best place for cruising wayfarer well laden. As for dan cranes FD being single handed the mainsail area quoted at 110 sq ft is about half way between a Phantom T 105sq ft and contender at 120sqft however still a lot of boat to single hand. Quoted Phantom sail size is measured area. Actual area is more like 11m/120sq foot. I built Phantom 88 from a kit really enjoyed as a boat slight snag that I only weighed about 10and half stone however won loads of light weather races should have won a light weather race at nationals in the 70s.The original brochure had 105 sq.ft but I am sure your figure is right.Having been near Bridge bouy in my 23ft Minitonner in mid 20s breeze I would not have wanted to be in a wayfarer in those conditions the race was the RTI so pretty good from safety point of view.We were fine and completed but lots of knots round back of the island. 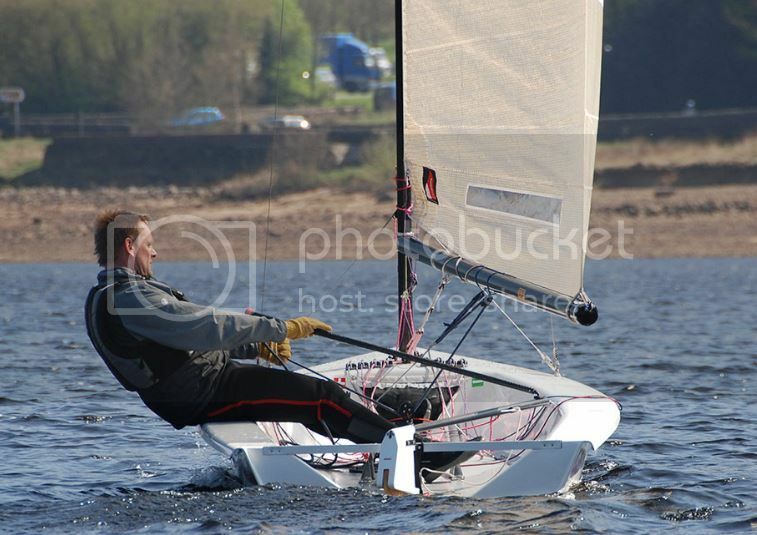 My son sails a Phantom & has been loosing weight by the stone to become more competitive. He finds he is going faster the lighter he becomes. Up wind he often comes in the first 3-4 at the windward mark. (The top sailors are really good) He feels that it is technique rather than weight that wins. Last edited by Daydream believer; 07-11-18 at 17:22. It is all down to the fact that my wife does not understand me !! Hmm, thanks DB, but in dinghies, I reckon the tall and the heavy are rarely at a disadvantage. It may seem like a disadvantage when there's very little wind, but as soon as it's blowing more than ten knots, which is usually, you gents have a big upwind advantage. I really like the Phantom for its muscular simplicity, light weight, and the fact it isn't a Laser - but with its whopping mainsail, smaller beam than the Osprey, and the fact it doesn't have a trapeze, it's unlikely to be easier for a 70kg man to keep upright in a F3+. And on the calm days, I know I'd always regret not being able to set 325sq ft downwind, inc spinnaker. Not that I ever have, yet. Handsome boat, the Phantom, though. Coming to this a bit late but ... . If there is any rot around the downhaul, you may need to drill out the whole section to good, dry wood (2-3cm hole drill), chamfer the edges then fill the hole with clear epoxy. Tape at one side and pour from the other is probably the best way. When the epoxy has set, fair the open side and re-drill through the epoxy. You might consider doing something similar with the nick at the top of the leading edge before it gets any worse. 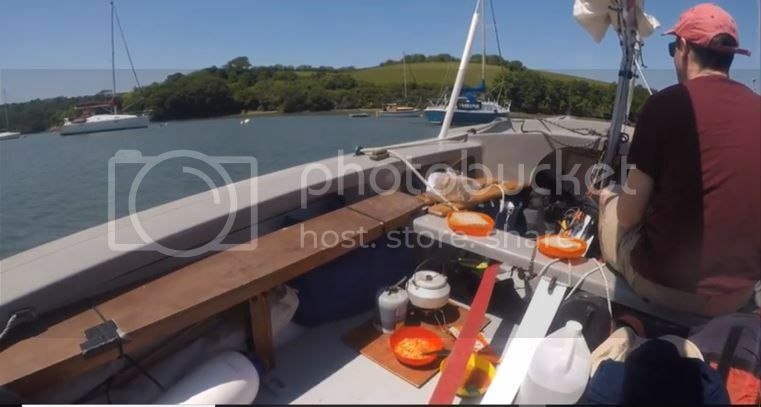 I like this photo from a Cornish Wayfarer cruise last year, on Youtube. It shows dinghies aren't too basic to allow food-preparation. We cooked soup and stew under way in a Fireball, on a calm winter sail. Last edited by Seajet; 18-11-18 at 21:04. Trangia kettle, utterly brilliant piece of kit. I know food on board is a subject that's been worked pretty hard on the forum, but stew on a Fireball, Andy? Just warming it up, I hope, rather than browning the floured braising steak in a frying pan then giving it the whole four-hour simmer in Burgundy and stock?